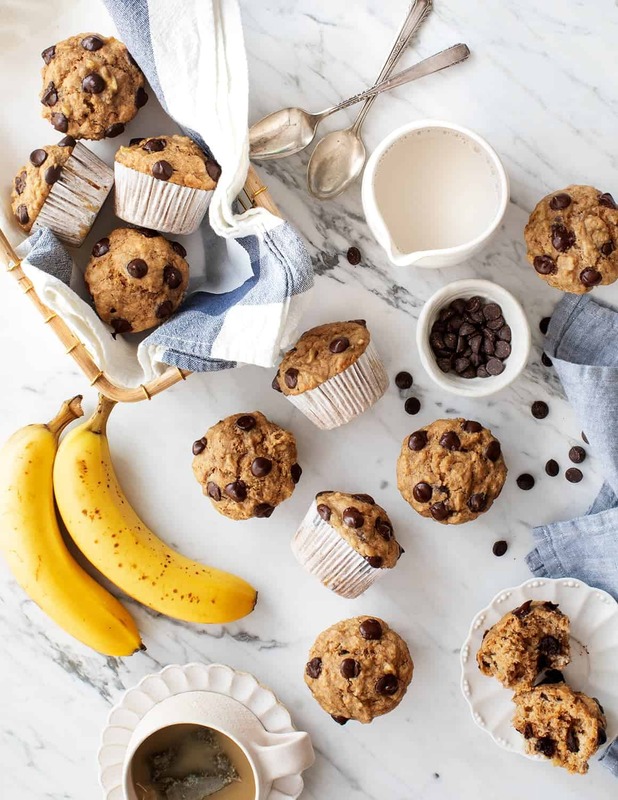 If you were to ask me which food most defines my childhood, I’d answer – without hesitation – chocolate chip muffins. During my entire childhood, not only did my mom make chocolate chip muffins at least once or twice a week for breakfast, but my grandmother would bring giant containers full of them whenever she visited. Even when I went off to college, my mom actually mailed the muffins to me. That means until I moved in with Jack, pretty much every day was muffin day! That’s why I’m honestly shocked that 6 years into this blog, I’ve yet to share a chocolate chip muffin recipe! I guess I got too distracted by zucchini breads and pumpkin breads over the years. These muffins are vegan(!) using my go-to non-dairy Almond Breeze almondmilk. To change things up this time, I used their Almond Coconut Unsweetened Vanilla Blend. These muffins don’t have an overly coconutty taste, but the coconut blend adds nice, subtle sweetness. I like to get the shelf-stable variety and keep it on-hand in my pantry until a muffin craving hits. 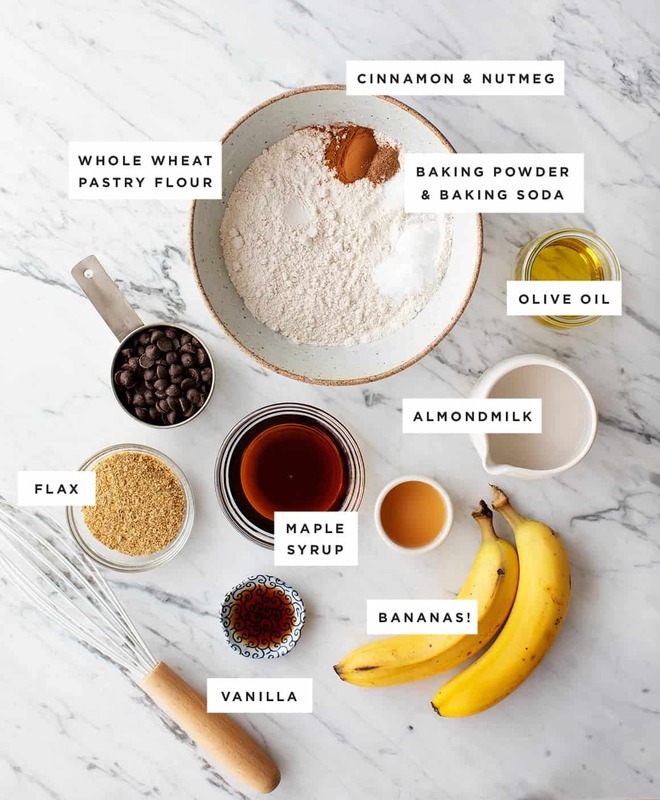 Of course, if you aren’t a fan of chocolate in your muffins, just leave it out and you’ll have delicious banana bread muffins. I think they’d also be great with blueberries in place of the chocolate, but don’t tell my younger self I said that. Preheat the oven to 350°F and lightly grease or spray a 12-cup muffin tin. In a small bowl, combine the flaxseed and warm water and set aside to thicken for 5 minutes. In a large bowl, combine the flour, cinnamon, nutmeg, baking powder, baking soda, and salt. In a medium bowl, combine the almond milk, apple cider vinegar, maple syrup, oil, and vanilla and stir to combine. Stir in the flaxseed mixture. Add the wet ingredients to the bowl of dry ingredients and stir just until combined. Do not overmix. Fold in the mashed banana and chocolate chips. Use a ⅓ cup measuring scoop to divide the batter in the muffin tin. Bake 18 to 20 minutes or until a toothpick comes out almost clean. Let cool 15 minutes, then transfer to a wire rack to continue cooling. *If you’re not vegan, and you prefer to bake with eggs, use 2 eggs instead of the flaxseed and water mixture. This post is in partnership with Almond Breeze. Thank you for supporting the sponsors that keep us cooking! When was the last time you went a bit outside your culinary comfort zone? I recently ventured into the world of spicy cocktails with this Pineapple Jalapeño Margarita. Most of my experiences with spicy cocktails in the past weren’t positive ones, as I find that spicy cocktails usually turn out a little too spicy. What I want (and rarely seem to get) is something balanced; not something that’s so hot from spice that it annihilates all the other flavors in the drink. This margarita, made for me by a friend, was her attempt to get me to change my mind. And—shocker—it worked! The sweetness of the pineapple tempers the tingle of the jalapeño. And the rim of the glass? Lined with salt and Tajín, a widely available Mexican seasoning made of salt, chili, and dehydrated lime. You can often find it in the spice aisle or the ethnic/Mexican food aisle of your local supermarket. Pro tip! In Mexico, you’ll often see it sprinkled over fresh fruit such as cantaloupe or mango. I highly recommend giving it a try for your next brunch or cookout. Lastly, this margarita uses barrel-aged tequila such as añejo or reposado (the golden-colored tequilas) to give it a toasty flavor. These are tequilas that have been aged in wooden containers. Aged tequilas are generally smoother and have flavors of vanilla, spice, caramel, and butter that pair well with pineapple. For your next Taco Tuesday, try giving this cocktail a go. It’s a perfect blend of sweet and spicy that’ll turn anyone with even the slightest fear of heat into a fan. Grilled Pineapple Jalapeño Margarita: Grill a few wedges of pineapple and a jalapeño or two until they have a nice char. Muddle them with the tequila and follow the rest of the directions below. The result is smoky and delectable. Cilantro Jalapeño Pineapple Margarita: Muddling a few tablespoons of fresh cilantro adds a lovely herbal flavor to the drink. Buy tequila that has been aged for at least two months is marked "100% de agave." Tequilas that aren’t are often mixed with fermented cane juice and result in an overly sweet, lesser quality tequila with way more burn on the way down. 1 Prep the glasses: Combine the salt and Tajín in a small bowl or plate. Next, take a glass (a cocktail or coupe glass will do, though a canning jar is just as easy) and rub the rim of it with a wedge of lime. Dip the glass into the salt and give it a small turn or two to coat the rim. 2 Infuse the tequila: Place the jalapeño and 3 tablespoons of the tequila into a pitcher. Using a muddler (or a wooden spoon, or potato masher), muddle together the tequila and the jalapeño for about 10 to 15 seconds. This will infuse some of the tequila with the heat and flavor of the chili pepper. If you want the heat to be stronger, continue to muddle and taste the tequila as you go. The more your bruise the chili pepper, the more spicy flavor will work its way into the cocktail. 3 Make the cocktail: Add the remaining tequila, pineapple juice, orange liqueur, and lime juice and stir together. Stir together and pour into the prepared glasses straight or over ice. This can be made a few hours ahead, but not too much longer as citrus juice has a tendency to become a bit bitter after extended contact with air. Hello! All photos and content are copyright protected. Please do not use our photos without prior written permission. If you wish to republish this recipe, please rewrite the recipe in your own unique words and link back to Pineapple Jalapeño Pitcher Margaritas on Simply Recipes. Thank you! Tequila: It isn’t just an ingredient for margaritas, nor is it just for shots during happy hour. Tequila is a spirit with a rich history and a wide diversity of styles, production distinctions, and flavor profiles. Just as you have to keep tasting wines, gins, or whiskeys to find the ones that are right for you, so it is with tequila. Once you do, you’ll discover a spirit that’s subtle, playful, and full of flavor—with none of the cheap burn you may remember from your youth. READY TO BECOME A TEQUILA EXPERT? This tequila guide will cover what makes a tequila a tequila and go over some basic definitions so you can dazzle yourself and others with tequila knowledge. I’ll provide some recommendations for tequilas that are widely available so you can begin to stock your home bar and ensure the best tequila experience for your next party or quiet night at home. Just as French law states that champagne can only be made in the Champagne region of France using specific ingredients and methods, Mexican laws detail what is and is not a tequila. These laws are recognized by more than 40 countries through various trade agreements. Tequila can only be distilled from only the blue agave plant. Tequila can only be produced in the state of Jalisco and limited municipalities in the states of Guanajuato, Michoacán, Nayarit, and Tamaulipas. Fun fact! The name tequila comes from the city of Tequila, which was established in 1666, though tequila was produced long before the town was born. While grapes, wheat, or corn can be harvested a few months to a few years later before being processed and distilled into alcohol, the blue agave plants used to make tequila are different. They take about 10 years to grow before they’re ready to be harvested for tequila. Agave harvesting: When ready to be harvested, the spiny leaves and roots are cut off the main plant body, called the agave heart or piña, which goes to processing. Process the agave: The hearts are slowly baked, which can sometimes take days. The slow cooking reduces caramelization and prevents the juices from turning bitter, thus maintaining the flavor of the agave. Crush the agave: Afterwards, the cooked hearts are crushed to release their sugary juices. This can be done by a mechanical crusher and grinder, or by the traditional way using a volcanic stone wheel called a tahona. Historically, a mule pulled the tahona, but these days an electric motor does the job. In theory, this slower practice of extracting agave nectar that will be fermented and distilled creates a more robust and complex flavor. Ferment the agave into tequila: The extracted juices are then fermented and twice-distilled as dictated by regulations. The distilled alcohol can then be bottled straight away or aged in wooden containers. A tequila can be organized into two categories, mixto tequilas and 100% agave tequilas. Mixto tequilas are made with no less than 51% agave, with the other 49% usually being fermented sugar cane juice. The result is a tequila that’s very sweet in both smell and taste. However, the flavor usually stops there. These mixto tequilas are often harsh in flavor, burn on the way down, and thus are inferior to other tequilas. Golden-colored mixtos are called joven (young) or oro (gold) tequilas and have oak flavoring and coloring added. The reason these are made in the first place is because they’re affordable to make for producers and, frankly, they sell well in stores due to their low price point. Mixtos aren’t ideal and I generally don’t recommend buying them. 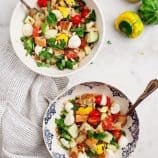 But if you’re planning a big party with a tequila-based punch that has a lot of juices and flavors to help mask the mixto, then a mixto is a practical option. If a tequila is labeled as “100% agave,” this means that the tequila in question was made with only blue agave. Generally, it’s recommended by most bartenders and tequila enthusiasts (and by your friendly Simply Recipes team) that you only buy tequilas which clearly state this on the label, as it will guarantee you a much better product that has a more complex flavor and significantly less burn. Pineapple Jalapeño Margaritas made with reposado or Añejo tequila. The amount of aging and the amount of agave used to make a tequila are what create the different varieties. Each variety has a different type of flavor, aroma, and price point. These are blanco, reposado, añejo, and extra añejo. Blanco: Blanco means “white,” but these tequilas are also known as plato (silver) tequilas. These tequilas are bottled right after distillation, or they are rested in wood barrels (both French and American oak barrels are used, but some companies even use old Spanish sherry barrels) for up to 60 days. The flavors and aromas of these tequilas can be herbal, floral, citric, and a bit fruity. Vegetal notes of poblano and green pepper can predominate. Reposado: Reposado translates to “rested,” and these tequilas are aged in wooden barrels anywhere from 2 months to a year. Their color is usually a softened, amber color. The flavors will be a bit woodier and less herbal, with hints of vanilla, butter, and brown sugar. Añejo: Tequila aged for 1 to 3 years are añejos, which translates to “old” or “aged.” The colors will be darker and more golden from the extended time spent aging in wood. Expect a much smoother tequila with big notes of spice, earth, smoke, vanilla, caramel, and peat. Añejos are generally more expensive than reposados due to the extended aging, though for most cocktail purposes the two are interchangeable. I recommend you start with reposado and see how you like it before dropping the extra cash for an añejo. Extra Añejo: Añejos that are aged in wood for more than three years. These are the priciest tequilas and, generally, should only be sipped so as to appreciate the nuanced flavors, aromas, and craftsmanship. The flavor is intensely woody, with a more pronounced burnt caramel flavor similar to very aged whiskey or even rye. If you find yourself striving to become a tequila connoisseur (aka: a Maestro Tequilero, or Tequila Master/Expert) then these are worth the investment. Mezcal: While all tequilas are mezcals, not all mezcals are tequilas. Tequila can only be produced using blue agave, but mezcal can be made from up to 28 different agave varieties. The agave is usually cooked for a few days underground over hot rocks or in cone-shaped fire pits. The result is a spirit defined by smoky flavors and aromas. Mezcal is often a bit heavier and sweeter than tequila. If you’re a fan of peaty scotch and the aroma of smoky BBQ pits, then mezcal may be for you. Keep in mind that añejo doesn’t mean “best,” it just means “oldest.” If you prefer the flavor of blanco, then buy blanco. Extra añejos are often the most expensive tequilas. The tequilas recommended here are by no means a comprehensive list, but rather suggestions for widely available tequilas across many price points. Avoid anything that is packaged in plastic or that costs less than $15 as these are signs of cheap tequila that’ll burn like hellfire down your throat and taste like lighter fluid. Buy only tequila that states “100% agave” on the bottle. It’s perfectly reasonable to find a smooth, flavorful tequila for $25-$30 that’s great for shots, cocktails, or sipping. A high price does not always indicate high quality. If there’s a worm or scorpion or, really, any animal in the bottle, then don’t buy it. It’s a marketing gimmick used to sell cheaply produced tequilas (likely a mixto) and it’s almost guaranteed to be dreck. The only mixto on the list, meaning it’s not 100% agave. Its affordable price point and general smoothness make it a good workhorse tequila. Taste: Very sugary followed by notes of citrus and pepper. Light and mild. If you don’t drink tequila too often then this may give you a bit of burn on the way down. Mixtos are best served well-chilled to keep their sweetness in check. Good For: Cooking purposes and punch bowls. If you’re going to use a tequila for cooking or marinades, then Jose Cuervo Especial is an ideal candidate. It’s not recommended for shots or for sipping, but great for a Long Island iced tea or other cocktails where the flavor of the tequila is negligible and other ingredients will lessen the sting of the tequila, such as this Long Island Iced Tea. 1800 Silver is a smooth tequila that spends 15 days resting in American oak barrels with a little bit of French oak added in. The name 1800 comes from the year tequila was first successfully aged in oak casks. Aroma: The aroma is reminiscent of oak with hints of citrus. Taste: Not as sweet as other tequilas; a predominant lime flavor. If you enjoy dry white wines such as pinot grigio or enjoy quality vodka then this is the tequila for you. Good For: Tequila shots, punch bowls, and tequila-based cocktails. 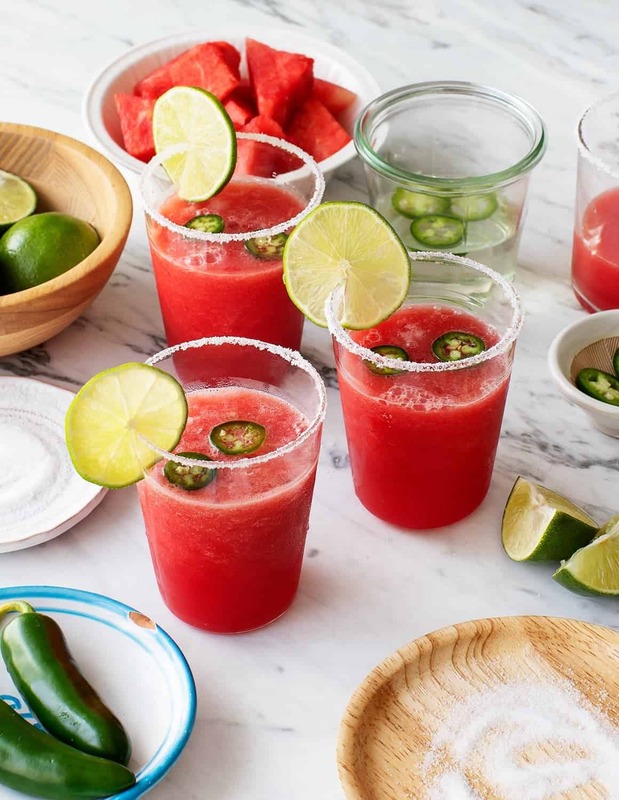 An all-around good tequila and wonderful in a watermelon margarita. Consider swapping out rum for this tequila in a mojito. Price: $20-$35, depending on bottle size and where you purchase. This brand occasionally goes on sale for $15; when it does pick it up for a future party or to use as a gift. Don Julio’s distillery steam-cooks their agave for 72 hours before being fermented and then going through two distillations, resulting in a richer and sweeter flavor. The tequila sees zero wood aging and goes straight to the bottle. Aroma: Pineapple, lime, and sage. Taste: The flavor starts with pineapple and lime before relaxing into sage and green bell pepper. Very smooth on the way down. If you’re trying to re-introduce someone to tequila who had a bad experience with it in their youth, this is a great one to start with. The herbaceous, peaty flavor at the finish makes this a good tequila for fans of scotch. Good For: Don’t cover up the flavor of this tequila in complicated cocktails. Serve over ice for sipping or use in a classic margarita. Price: $35-$40. The tequila to use for dinner parties and serving to friends who appreciate good food and drink. Introduced in 1989, Patrón Silver Tequila is often associated with premium tequila due to aggressive marketing in the 1990s, which branded Patrón as a sophisticated spirit. The slow-roasted agave is processed using half tahona-crushed agave and half modern roller-mill crushed agave before fermentation in wooden vats. Fun fact: this brand was co-founded by John Paul DeJoria of John Paul Mitchell hair products. Taste: Patron Silver is clean tasting, with hints of citrus and white pepper. It has what most would consider to be a classic tequila flavor. Some love Patrón because it’s what they grew up with, while others find it a bit harsh. Good For: Patron Silver is a standard-bearer tequila. Great for sipping, shots, or cocktails, but there are better options for each of these purposes. It’s a jack of all trades, but master of none. Try it in a blueberry margarita or pomegranate paloma. Price: $35-$45. A fine tequila, but its high price can be off-putting. Best to buy when on sale. A triple-distilled tequila, this brand’s iconic tall, skinny bottle has made it a popular choice for tequila. The hay-colored reposado spends six months aging in American oak whiskey barrels. Leyenda also produces an excellent silver tequila worth trying, as well as a wonderful and affordable añejo. Aroma: Very oaky, with hints of straw and baking spices. Taste: The taste is buttery from the oak with flavors of citrus, butterscotch, and vanilla. There’s also a natural saltiness to this tequila that makes the sweeter flavors even better; it’s very smooth to drink. If you love California chardonnays or are a fan of whiskey, this is your tequila. Good For: Substitute this tequila for whiskey in cocktails. Pairs well with lime, orange, and tropical fruits such as pineapple. A phenomenal reposado for shots and for cocktails. Fantastic in a pineapple and jalapeño margarita. Casamigos (loosely translated to “house of friends”) is the popular tequila created by George Clooney. Celebrity brands of alcohol are often disappointing; however, Casamigos tequilas are all solid (they come in plato, reposado, and añejo). The reposado is aged for seven months in whiskey barrels. Most tequilas are 76 proof (38% alcohol) but this one is 80 proof (40% alcohol). However, it’s so smooth you’d never know it. Aroma: Tropical flavors of pineapple and passionfruit backed up with vanilla. Taste: Almost opposite to the aroma, this reposado bursts in your mouth with the taste of mint, sarsaparilla (root beer flavor), and vanilla. Extremely smooth and goes down dangerously easily. Strangely, it almost doesn’t taste much like tequila. Good For: This is the gateway spirit for the friend who doesn’t like tequila. Use in a tequila hot toddy (yes, that’s a thing!) or serve over ice for sipping. Cocktail-wise, the classic margarita is probably the best way to go. A strange origin story for tequila, Olmeca Altos was started by two UK bartenders and an expert tequila master from Mexico. The agave is slow roasted in brick ovens and tahona-crushed before a double-distillation in copper stills. The tequila is aged for 18 months in bourbon oak barrels. Aroma: Vanilla and almond are predominant. In a way it’s almost Christmas-y. Taste: Roasted flavors of vanilla, caramel, brown sugar, and brown butter. The tequila is the smoothest one on the list and slides down with zero burn. Good For: Elegant and perfect in a pineapple margarita, or served over ice with a slice of orange and sipped on a hot afternoon. Price: $20-$30, depending on where you buy. With this price, you could even use it for guilt-free shots. There aren’t a lot of widely available mezcals on the market, but you can usually find Vida at liquor stores and certainly online. Mezcals are a love-it-or-hate-it spirit, and how much you enjoy the flavor of smoke will be the deciding factor for you. Aroma: Smoke, smoke, and smoke. Oh, and some poblano pepper. Taste: While all mezcals are smoky, this one is particularly so. The smoke is reminiscent of eucalyptus. This tequila has an oiliness to it that’s characteristic of mezcals and so it feels heavier on the tongue and finishes with a citric flavor. No burn and goes down easily. Good For: Use in cocktails, punches, shots, and sipping. You can swap mezcal for tequila in most recipes. (To mix up your next brunch use it in place of vodka in a Bloody Mary.) If you enjoy the smell of a good cigar, then you’ll love mezcal. Price: $30-$35. A fine price for a mezcal. Not too cheap and not too pricey. TRY THESE COCKTAILS WITH TEQUILA! Is there anything better than making an entire meal on one pan? No there is not. I complied over 20 healthy sheet pan dinners that make weeknight meals a breeze! You’ll need a sheet pan. Nine times out of ten your entire meal goes on that sheet pan. Meal prep and baking is a breeze. When the oven timer goes off, your entire meal is ready. WHAT! I’ve decided that I need more sheet pan dinners in my life. The best thing about them is obviously that they only use one pan! Team less dishes for life. I also love how the flavors all kind of combine and mesh on the pan… not in a bad way but in a true, put together meal way! These meals are amazing fresh out of the oven but really great as leftovers as well. Repurpose as is, eat over grains, eat over greens for an easy meal-sized salad – the options are endless! Here I’m sharing a few sheet pan recipes I’ve created, but also featuring some of my friends and recipe creator pros in the blogging world! 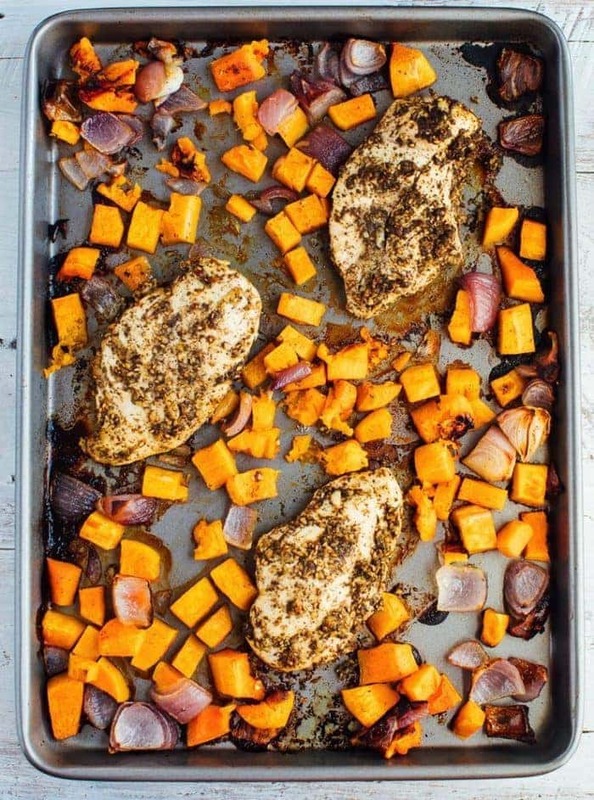 One Pan Za’atar Chicken Bake – I love this Middle Eastern sheet pan dinner with za’atar roasted chicken, red onion and butternut squash. It’s especially delicious topped with tahini sauce! One Pan Roasted Chicken with Butternut Squash and Brussel Sprouts – One of my most popular dinner recipes here on EBF. 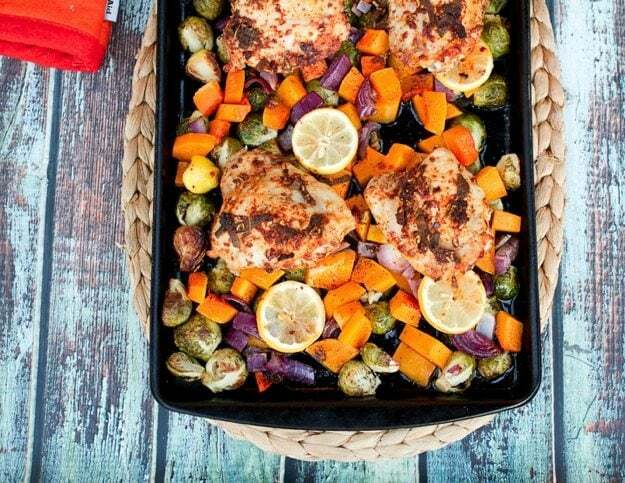 This roasted chicken sheet pan dinner is so easy to throw together and the combo of butternut squash, red onion and brussels is delish. 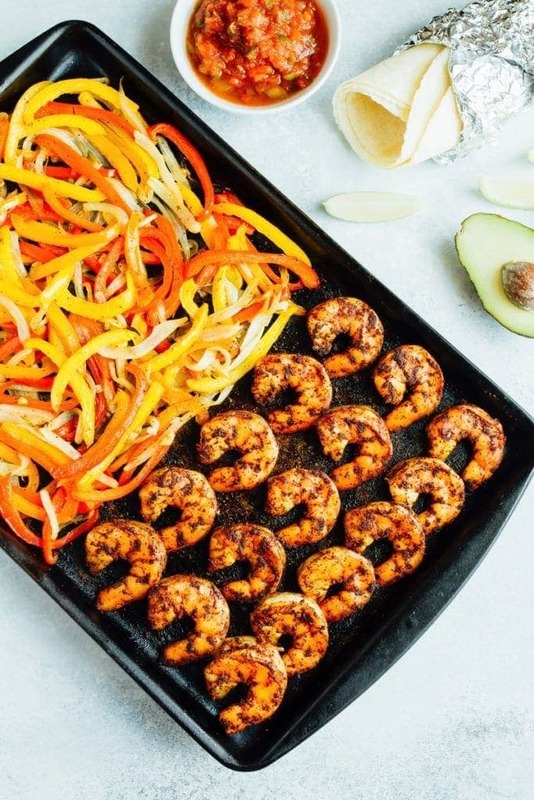 Sheet Pan Shrimp Fajitas – Fajitas made on one sheet pan? You got it! One of my favorite dinners just got easier. Sheet Pan Egg Chorizo and Egg Bake by Lexi’s Clean Kitchen – Whether you make this for breakfast or for dinner, this sheet pan meal is like a hash on a pan. SO GOOD. 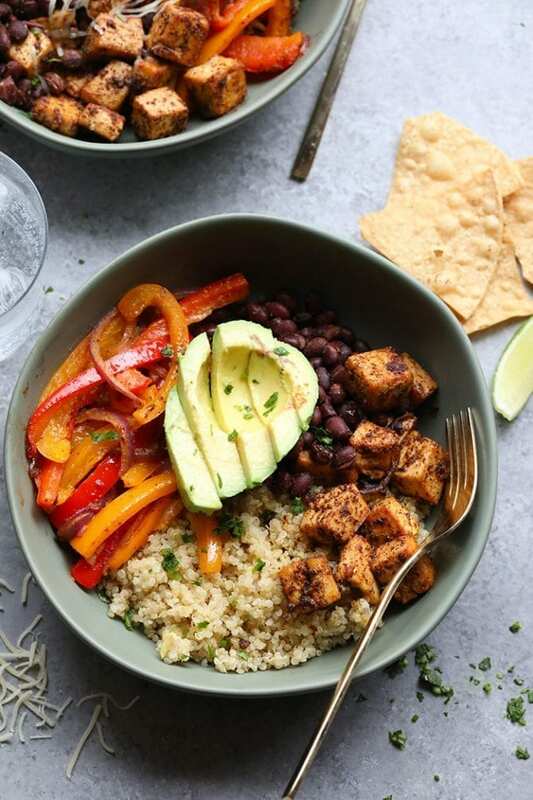 Sheet Pan Meal-Prep Tofu Quinoa Burrito Bowls by Fit Foodie Finds – You know I love my bowl meals. And bowls that only dirty one pan get bonus points from me. 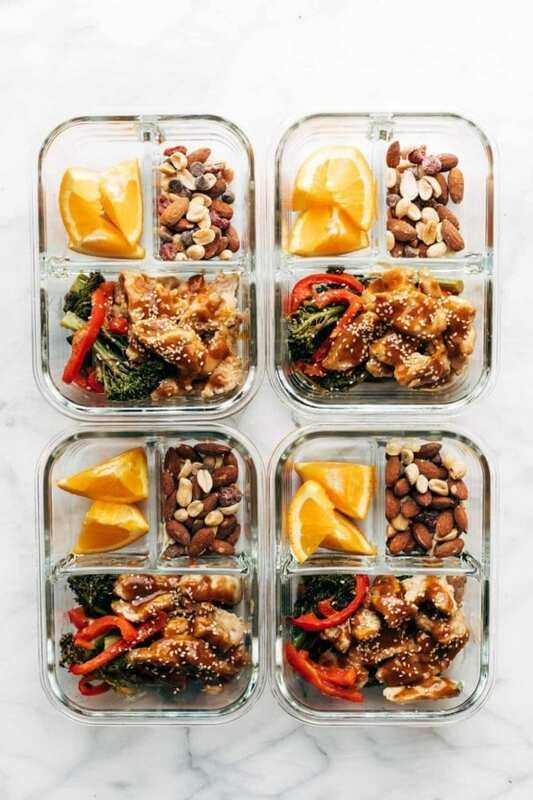 Sheet Pan Garlic Ginger Chicken & Broccoli by Pinch of Yum – As you can tell from the picture, this garlic ginger chicken and broccoli is absolutely perfect for meal prepping. 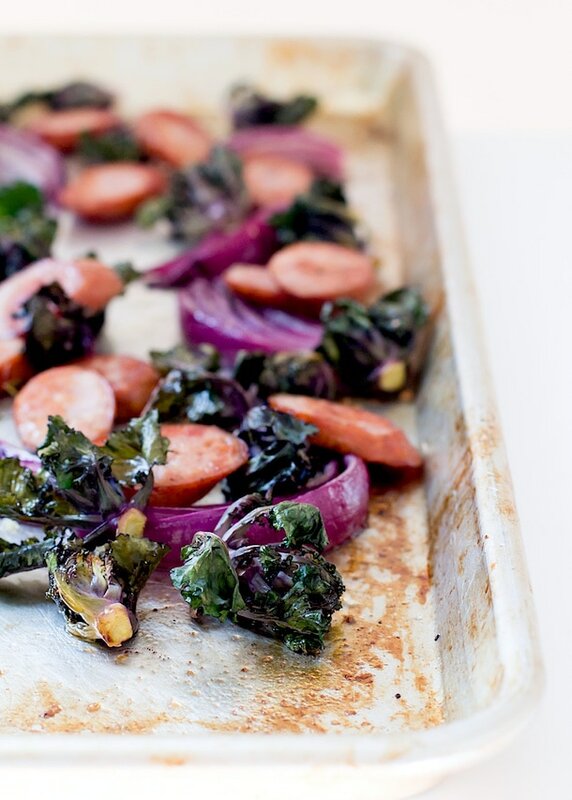 Chicken Sausage, Kalette and Red Onion Sheet Pan Supper by Heartbeet Kitchen – I love when simple ingredients work together to make a delicious meal. This is one of those meals. Plus, how cute are those kalettes? 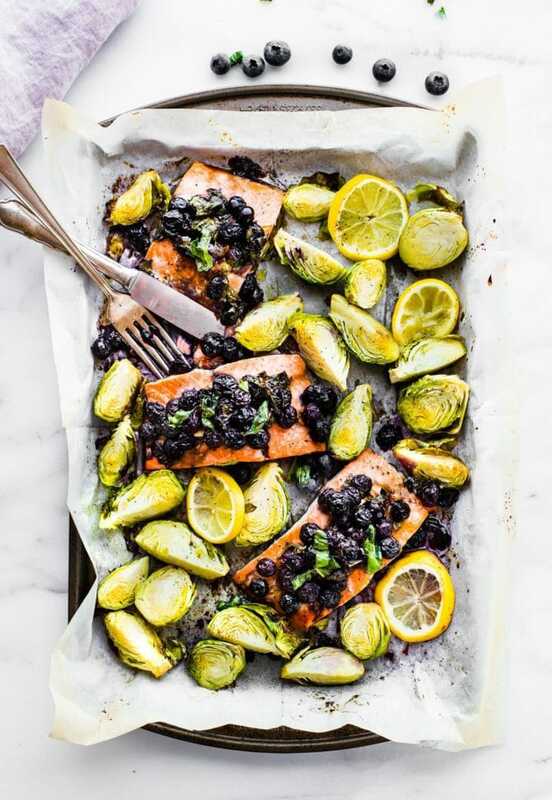 Superfood Baked Salmon by Cotter Crunch – Salmon and sprouts is one of my favorite combos, but this sheet pan meal takes things to the next level. The blueberry basil mixture on the salmon looks out of this world! 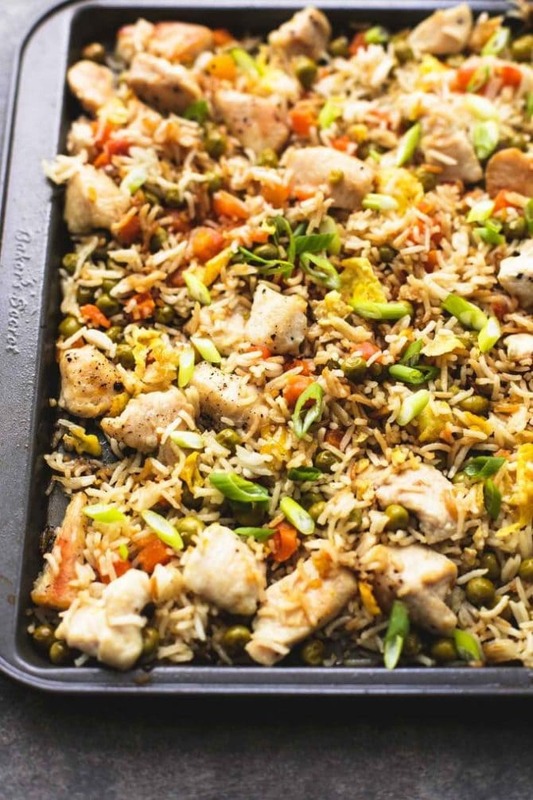 One Sheet Pan Chicken Fried Rice by Creme de la Crumb – Who knew you could make fried rice on a sheet pan? Not me, until now! So excited to try this meal. 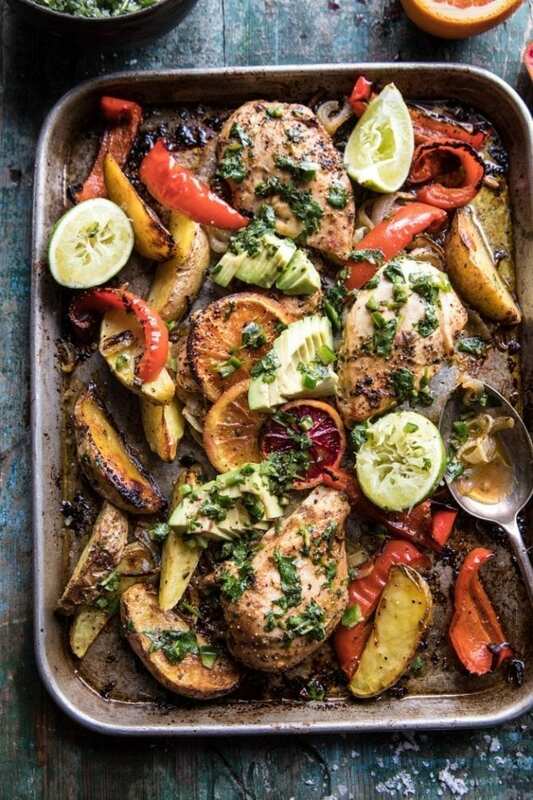 Sheet Pan Cuban Chicken with Citrus Avocado Salsa by Half Baked Harvest – You had me at “Cuban”. 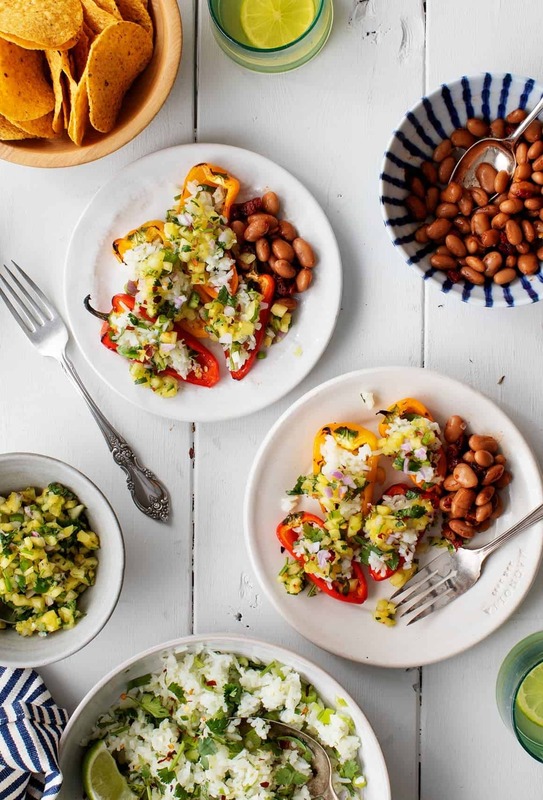 This sheet pan dinner looks incredible and the citrus avocado salsa has me drooling. 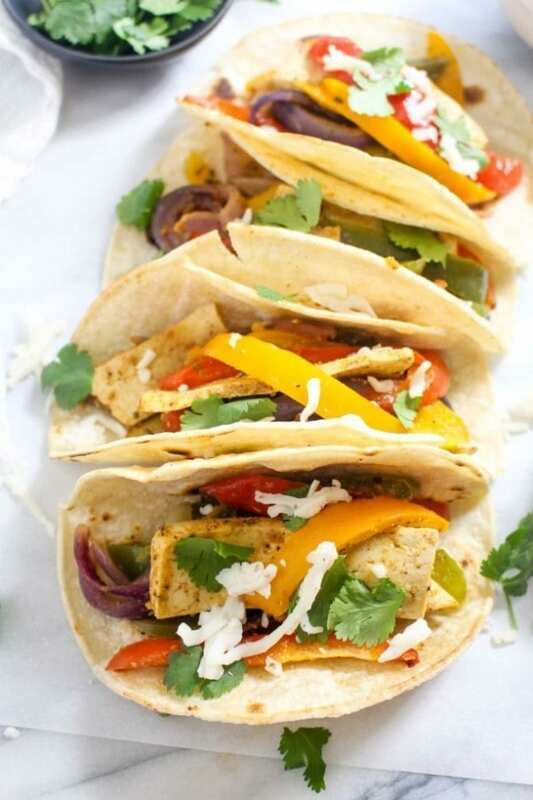 Sheet Pan Tofu Fajitas by Catching Seeds – Another fajita recipe, but using tofu so it’s vegetarian! The perfect “Meatless Monday” meal! 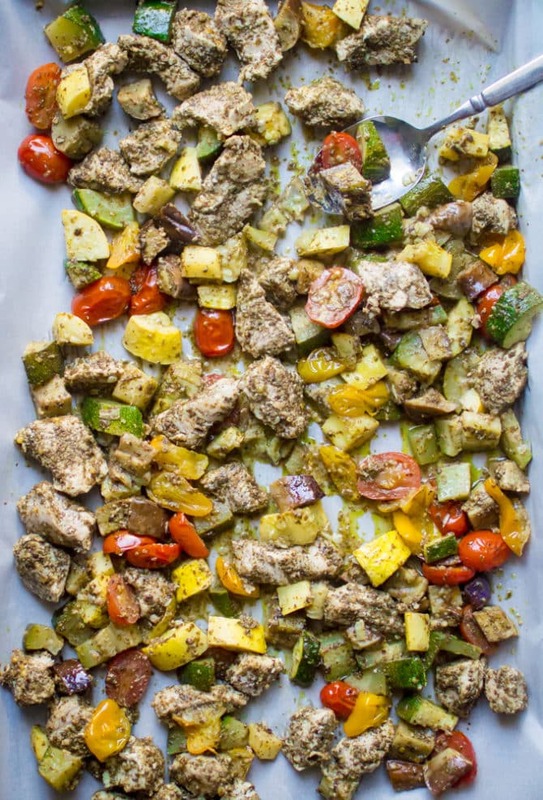 One-Sheet Pan Pesto Chicken & Summer Veggies by The Natural Nurturer – This is summer on a sheet pan. It’s times like these that I dream of having a garden to grow all of these delicious veggies! 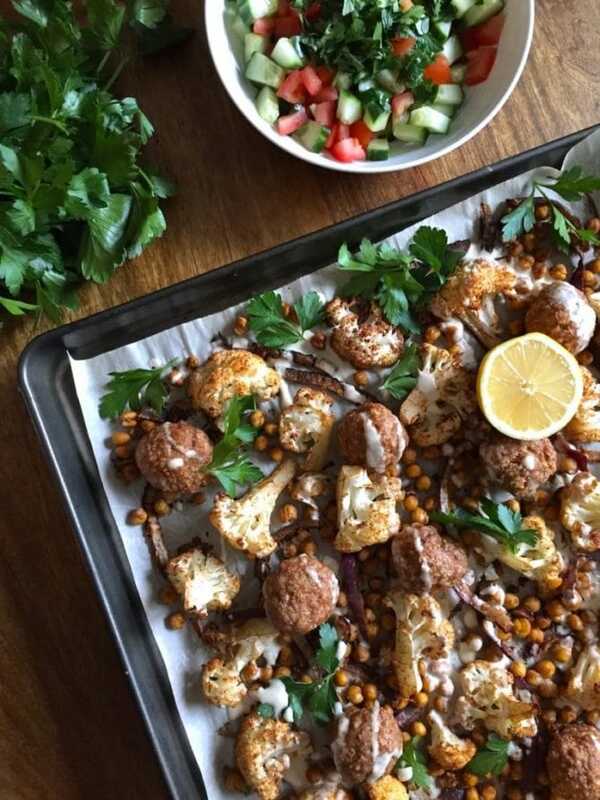 Middle Eastern Turkey Meatballs Sheet Pan Dinner by How To Eat – You know I’m obsessed with Middle Eastern food. 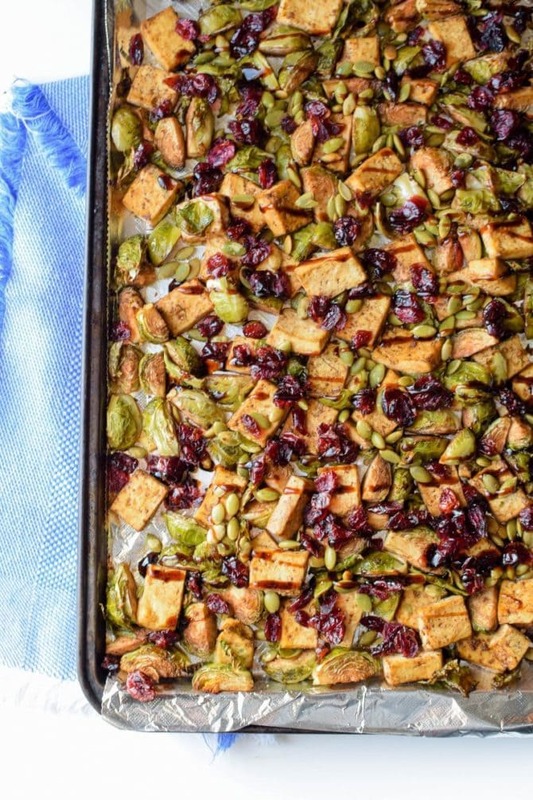 Cannot wait to make this sheet pan dinner! 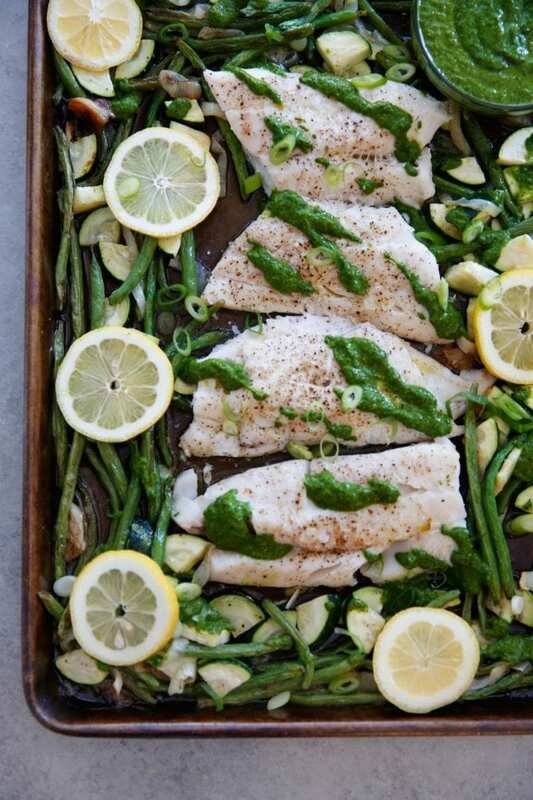 Sheet Pan Cod with Vegetables in Lemon Herb Sauce by Lexi’s Clean Kitchen – I’ve been trying to incorporate more fish in my diet so this meal will definitely be happening soon! 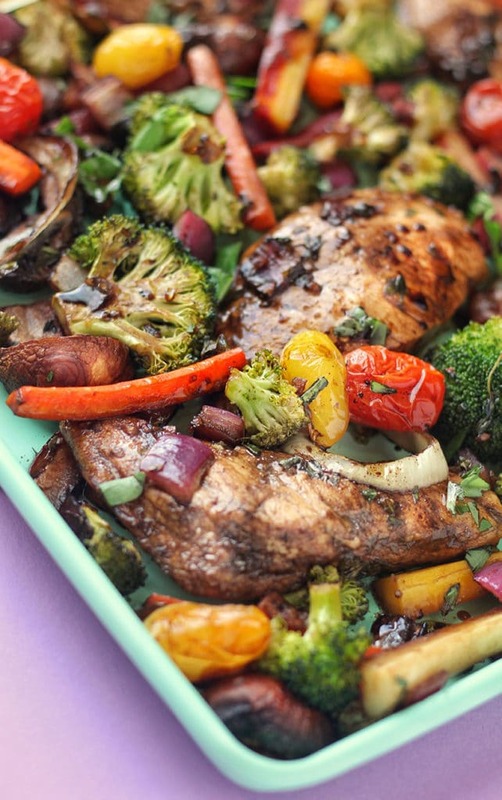 Balsamic Chicken and Veggies Sheet Pan Dinner by Nosh and Nourish – I can see this going into my dinner rotation. Eat this as is, on grains or even on greens! 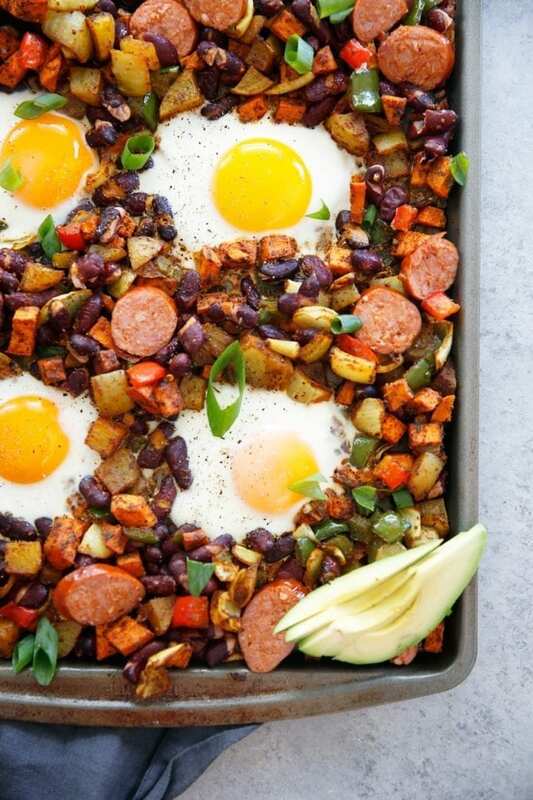 Sheet Pan Breakfast Bake by PaleOMG – Another “brinner” or “breakfast for dinner” option that looks incredible. I love that you can throw everything on one pan and pop it in the oven! So much easier than making breakfast with my usual 13 pans. 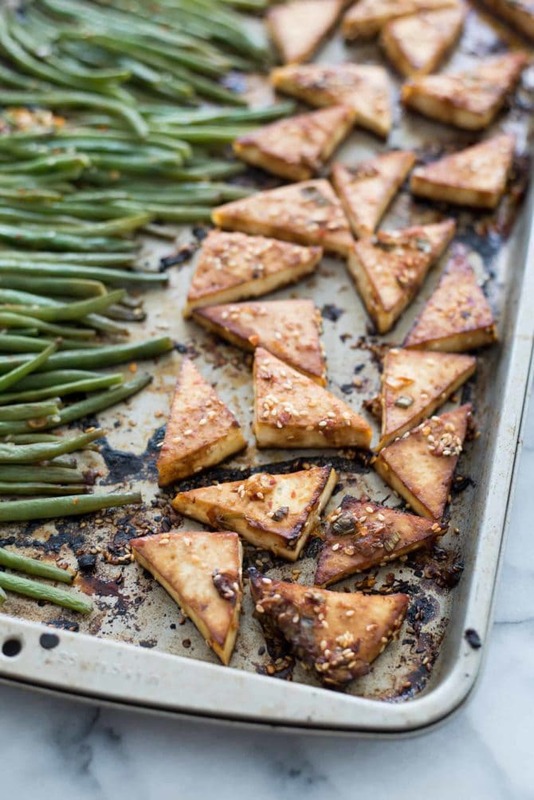 Sheet Pan Spicy Tofu + Green Beans by Delish Knowledge – Spice + tofu is my jam. 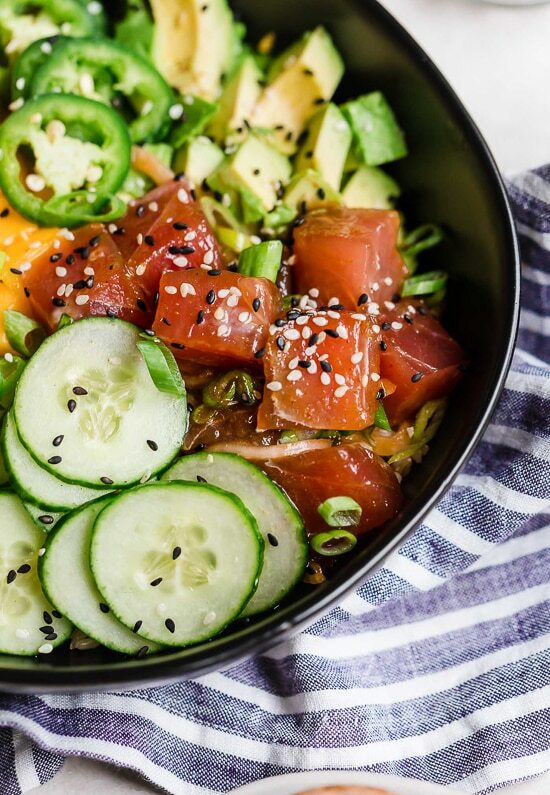 I would probably eat this over cauliflower rice… looks so delicious! 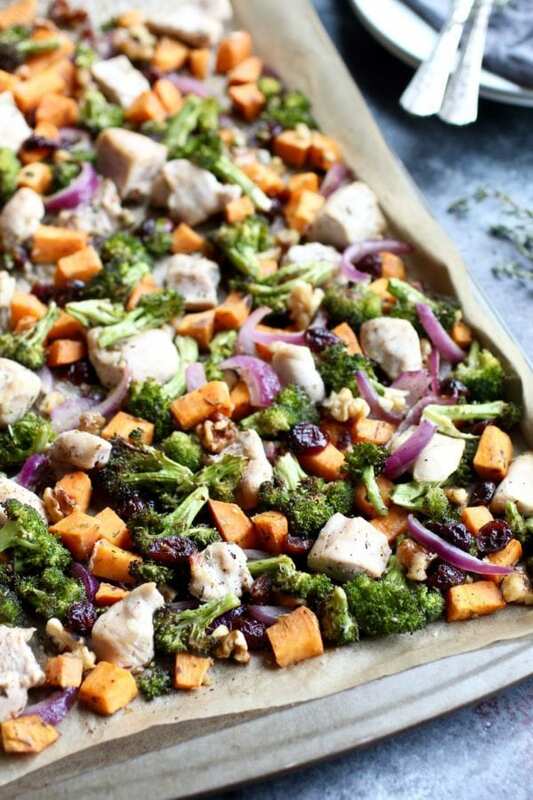 One-Pan Sweet Potato Broccoli Chicken Bake by The Real Food Dietitians – Have you guys roasted your veggies with dried fruit before? For some reason I always forget about the delicious fruit/veggie combo but this is happening ASAP. 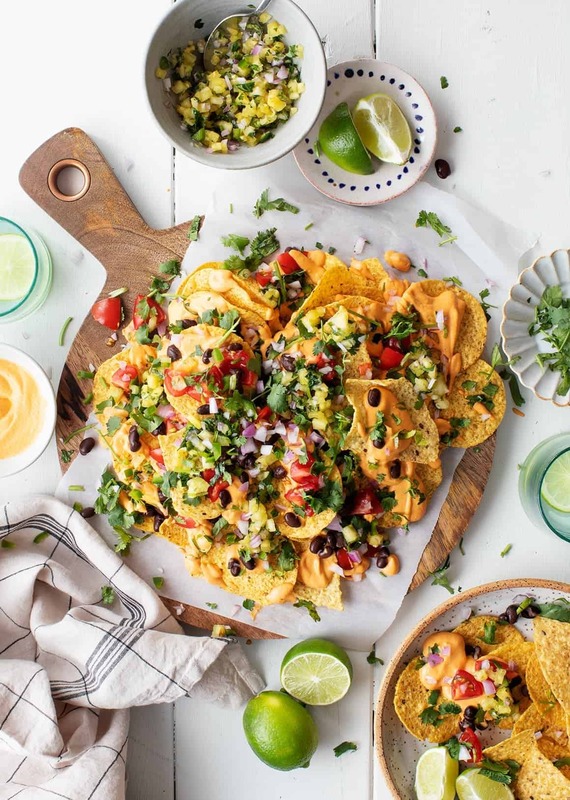 One-Pan Cauliflower Nachos by Fit Foodies Finds – I’m obsessed with this idea of using cauliflower instead of chips for upgraded nachos! 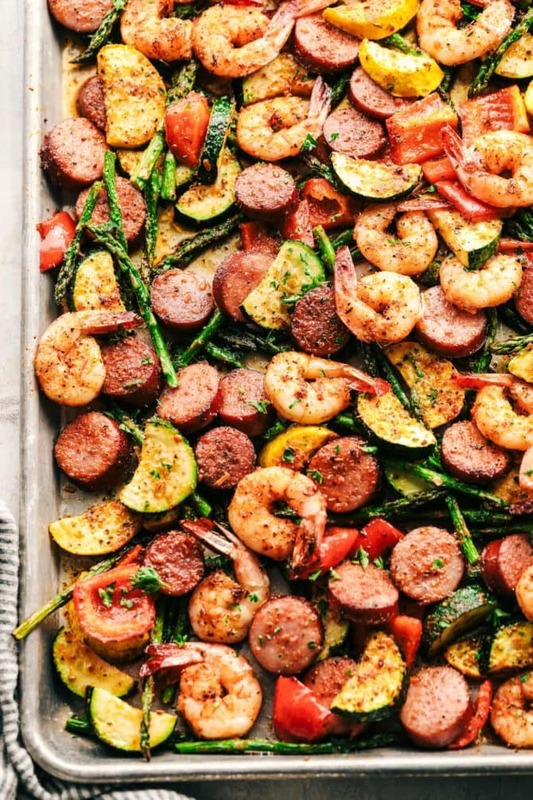 Cajun Shrimp and Sausage Vegetable Sheet Pan by The Recipe Critic – I feel like most cajun recipes are really involved and take a lonngggg time. Not this one! Love the combo of spices and veggies in this dish. Sheet Pan Garlic Tofu & Brussel Sprouts by Emily Kyle Nutrition – This meal has it all: veggies, fried fruit, seeds, a balsamic glaze. So excited to have this delicious fall dinner! Do you love sheet pan dinners as much as we do? Have a favorite sheet pan recipe? Please share it below! The post 21 Healthy Sheet Pan Dinners appeared first on Eating Bird Food. It’s just about Labor Day weekend, and my thoughts are: oh noooooo(!! ), how did we get here already! Warm nights grilling out on our back deck… sunny farmers market strolls… available fresh produce… I’m not quite ready for this season to end but I will try my best to embrace fall as it comes. Until then, hear’s a wrap-up of ALL of my favorite recipes that I made this summer. I’m hoping they provide a little inspiration for your weekend festivities! You can click directly on the images to go to each recipe. These are easy to make and naturally sweetened by the watermelon, which makes them borderline healthy :). The jalapeño gives them a fun, spicy kick. 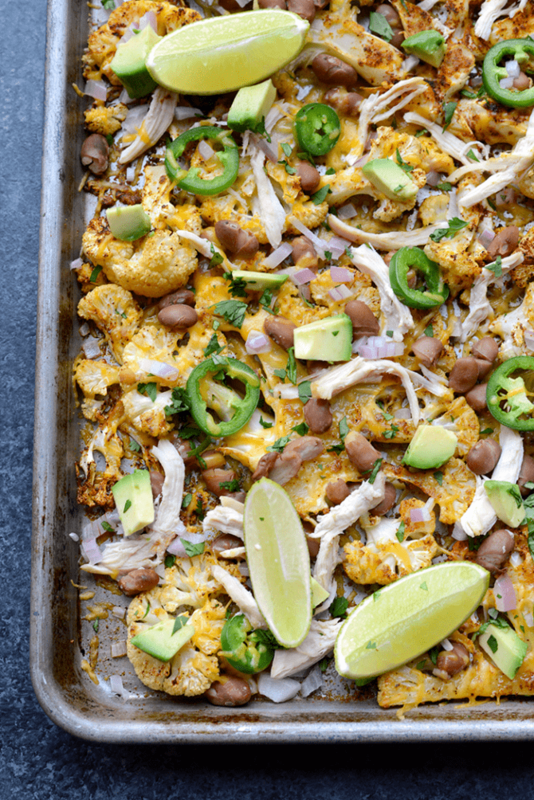 I think this was the biggest fan favorite recipe of the summer – I’ve been tagged on SO many photos of these cauliflower nachos since I posted them. The “cheese” sauce, with cauliflower blended in, is completely vegan. Loaded with black beans, tomatoes, and pineapple salsa, these nachos are a meal by themselves. If you have extra pineapple salsa from the nachos above, use it to make these cute little stuffed peppers! They’re stuffed with herb-y cilantro lime rice and served with adobo-spiced pinto beans. Just add margaritas (also above). These are a great party option because you can prep everything in advance. 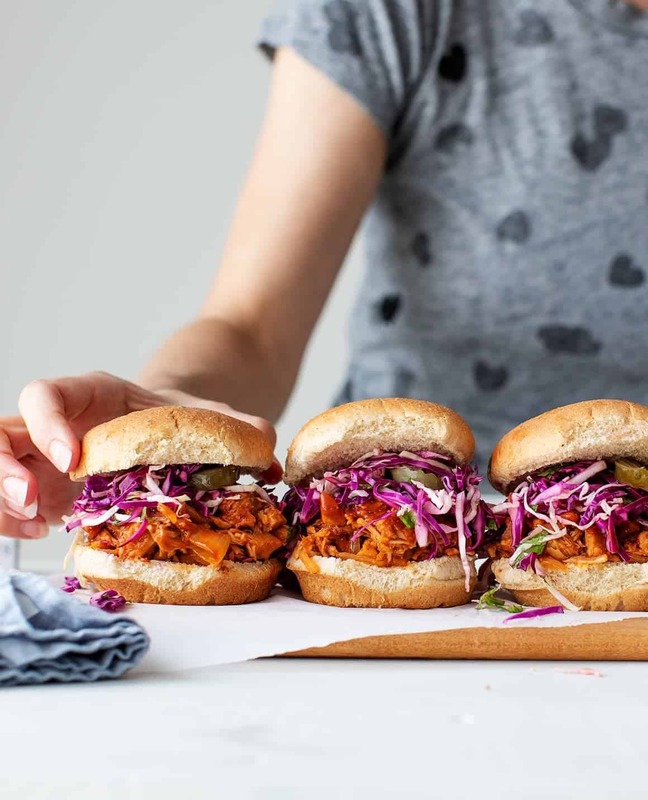 Jackfruit is simmered in an easy homemade chipotle BBQ sauce, then the saucy sandwiches are piled high with a tangy slaw. Pass the napkins. I’d make these not only for Labor Day, but for pretty much any day. 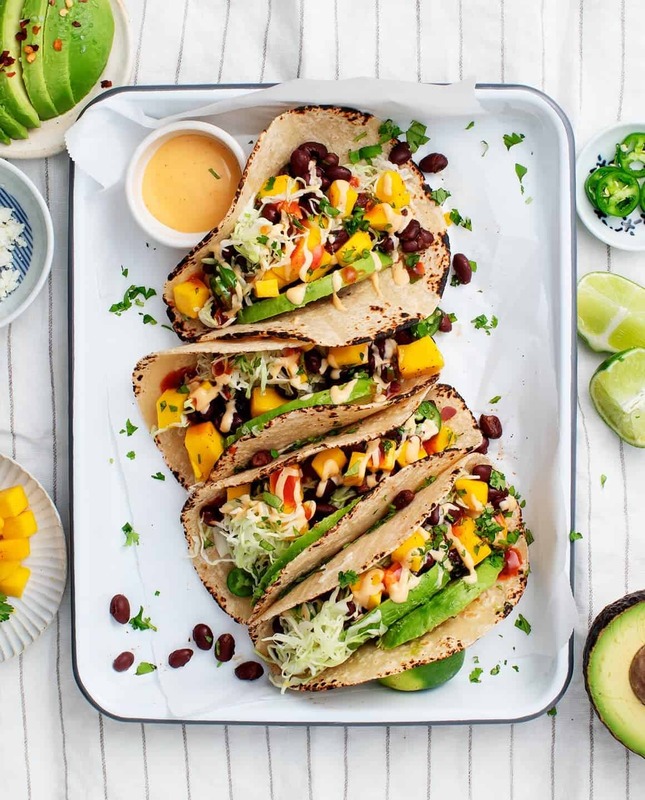 These fresh tacos are so fast and easy to put together. I love how the mango adds a pop of sweetness. 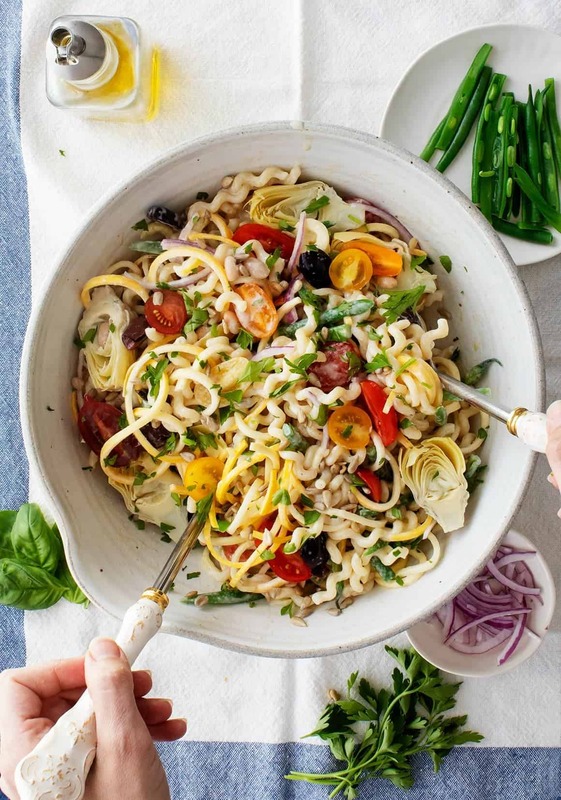 Every cookout needs a pasta salad and I love this one because it’s loaded with fresh vegetables. The sauce is made with a tangy tahini sauce instead of a typical mayo base. Make this one before peach season is over! Another fan favorite! I’ve seen so many insta-tomato salads since I posted this one. 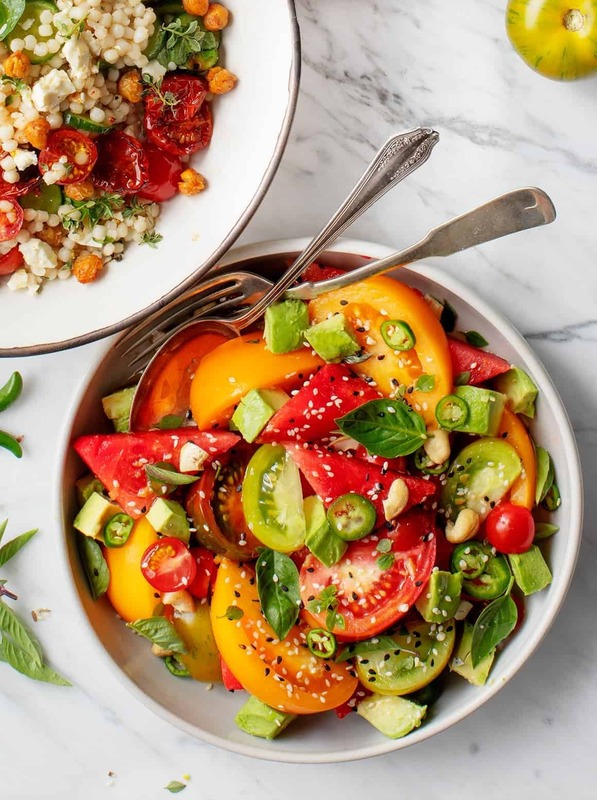 This recipe has great texture – half of the tomatoes are slow roasted until shriveled and jammy and half are left fresh and juicy. 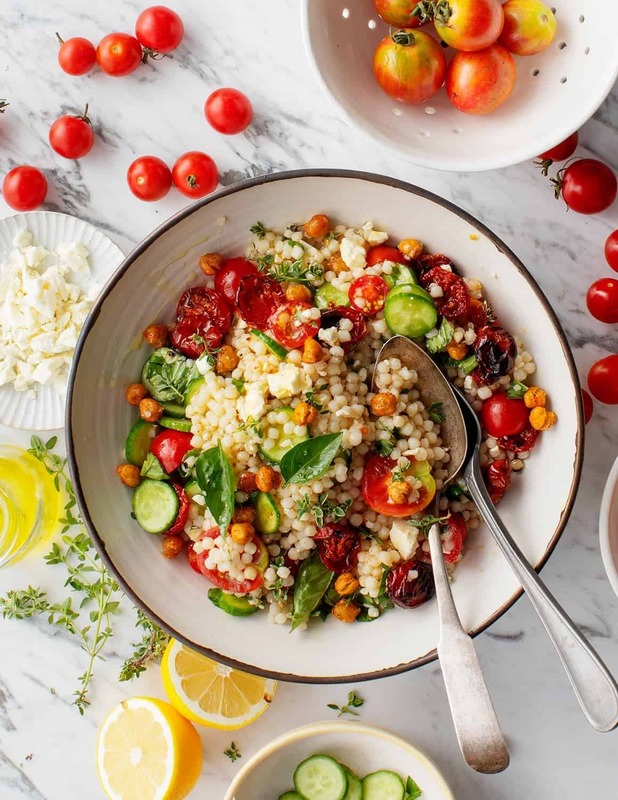 They’re combined with cucumbers, couscous, crispy chickpeas, and a bunch of fresh herbs. Make this one while tomatoes are still at their peak! My personal favorite. I love the balance of sweet/savory/spicy flavors. You can’t quite see the dressing, but it’s a light tamari-lime dressing that goes perfectly with the sweet watermelon, spicy peppers, and creamy avocado. 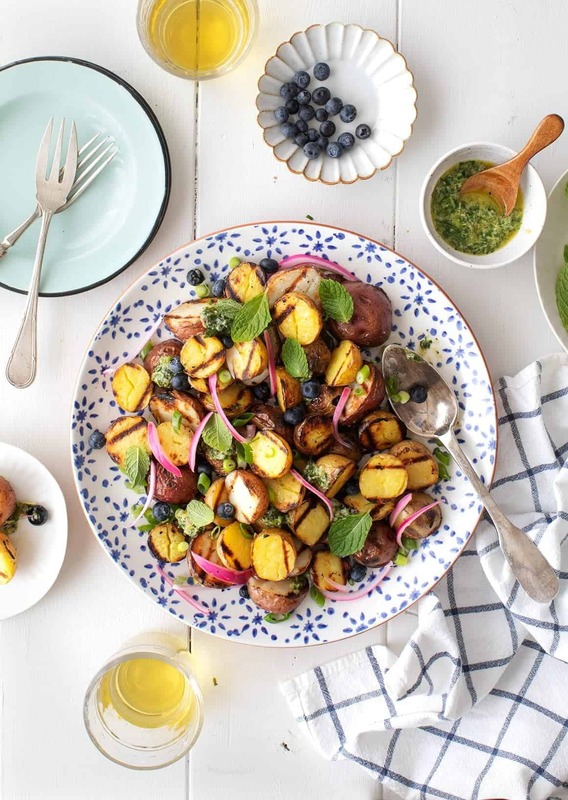 Not your ordinary potato salad – this grilled scallion vinaigrette is SO flavorful over the grilled potatoes. If you’re grilling this weekend, give this one a go! I love this simple dessert from the Sweet Laurel Cookbook. 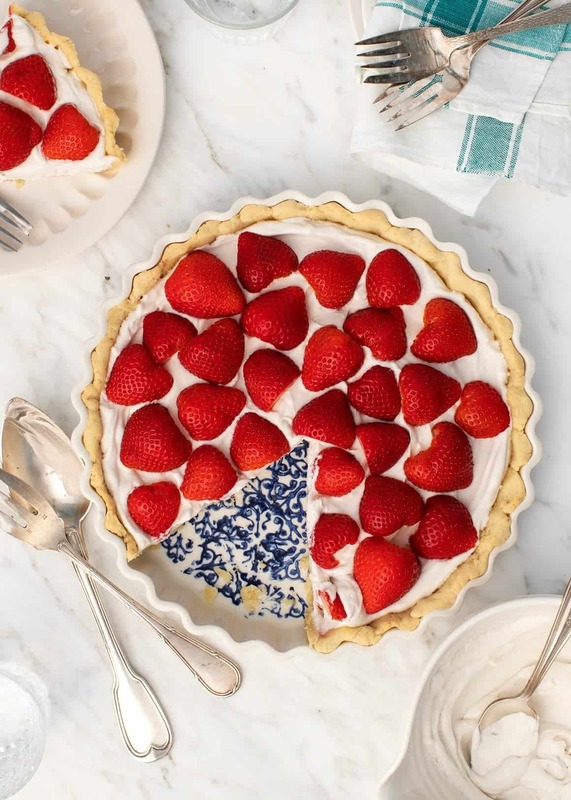 It’s made with an easy gluten free almond flour crust, a lemon coconut cream filling, and it’s topped with fresh berries. Delish. 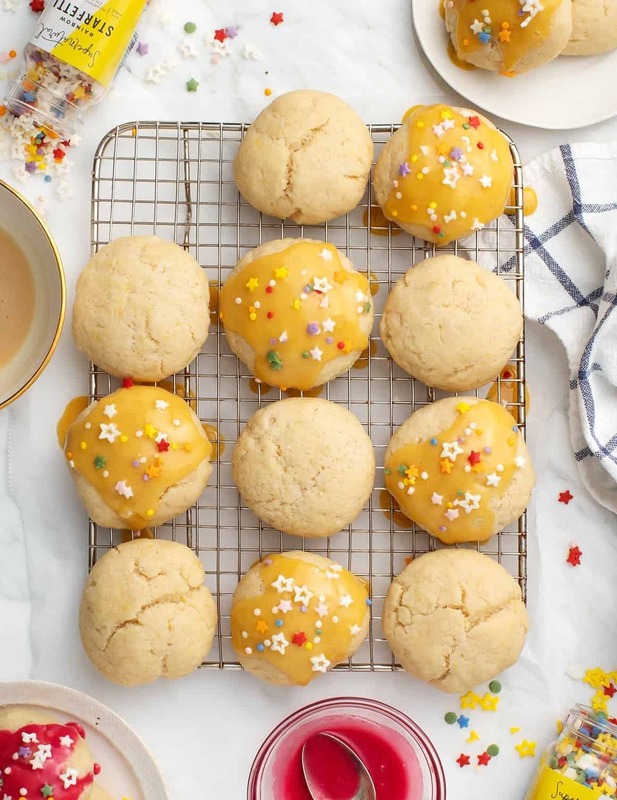 These lemony cookies are lightly sweet and have a wonderful nutty flavor from the almond flour. They’re fun to make and fun to decorate with the cashew icing and these cute, naturally colored Supernatural sprinkles ? 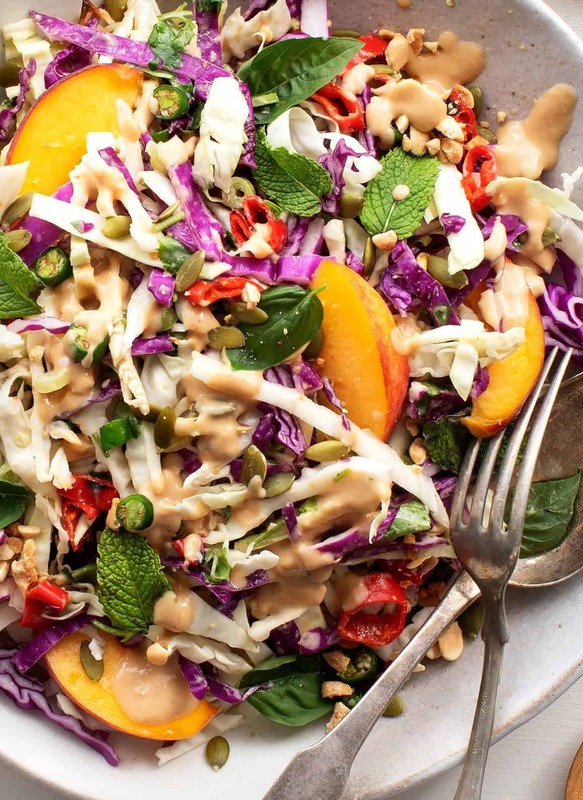 The post Vegetarian Labor Day Recipes appeared first on Love and Lemons. 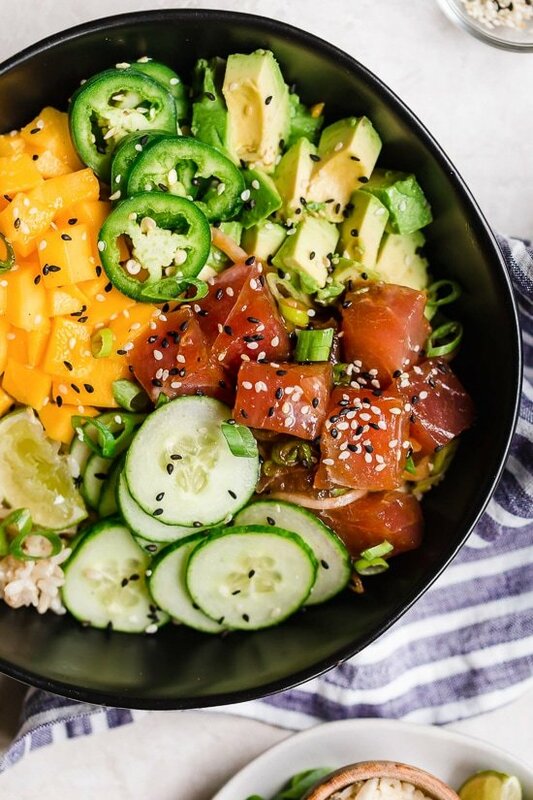 With marinated tuna, brown rice, avocado, cucumber, mango, macadamias and scallions, this Hawaiian style quick Ahi Poke Bowl is perfect for hot summer nights. 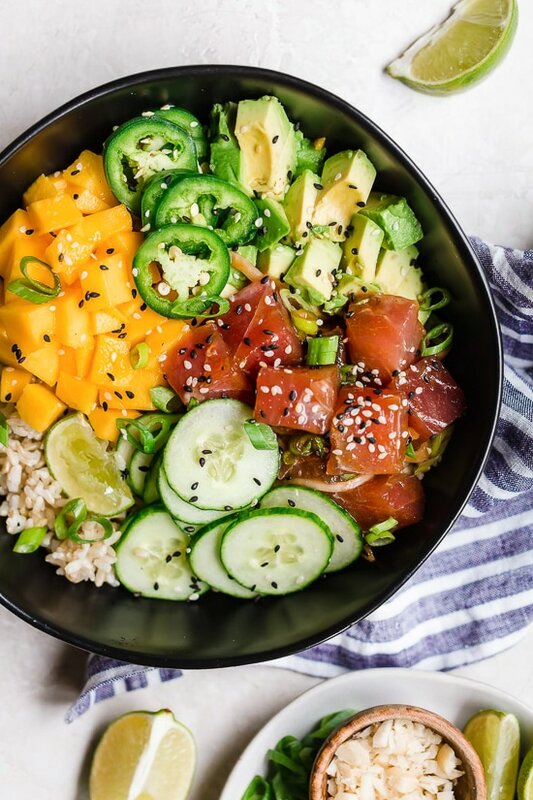 I love Poke bowls and often make them when I crave sushi! 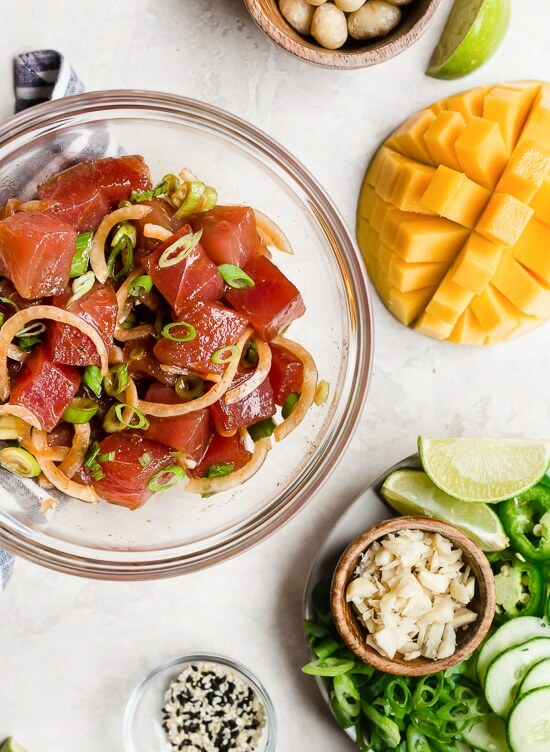 A few favorite dishes that satisfy my sushi cravings are Shoyu Ahi Poke, California Shrimp Stacks and California Spicy Crab Stuffed Avocados. 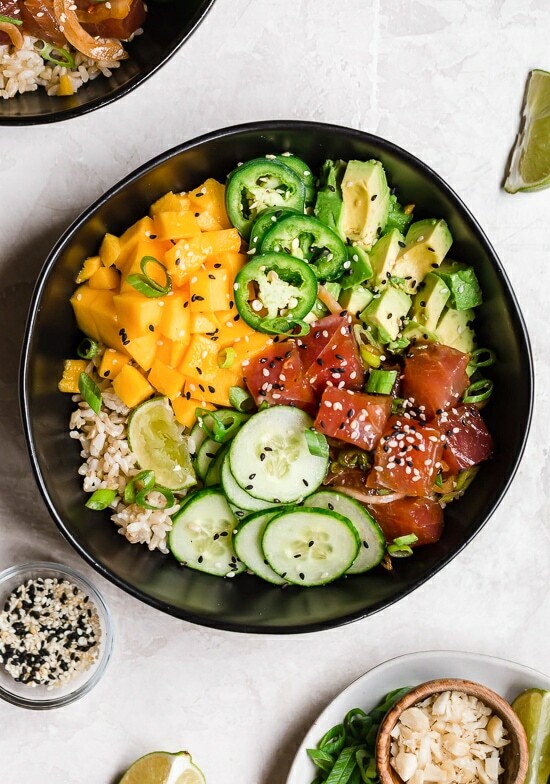 I’m also really digging this poke bowl with mango and avocado, a guest post by my friend, Heather K Jones, please welcome her! Hey there, I’m Heather K. Jones—I’m a registered dietitian and a wellness coach, and right now I’m hosting a totally FREE 4-part Feel Better Eat Better video workshop. If you struggle with emotional eating, binge eating, or food or body image issues of any sort, you really don’t want to miss this free workshop! You can sign up for the workshop right HERE. While visiting Seattle a few weeks ago my sister Lori (who was just back from a Hawaiian vacation!) 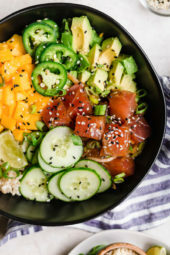 made me this delicious Hawaiian style bowl for dinner, and I’ve made it several times since. 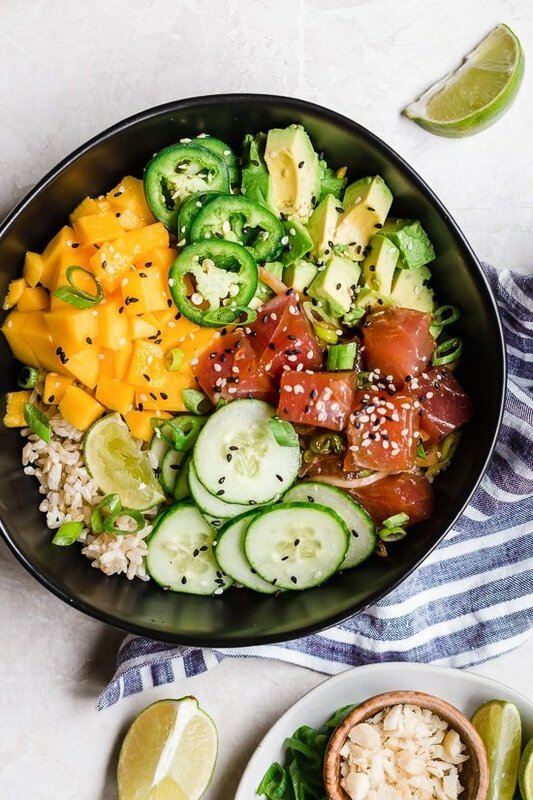 Marinated sushi-grade tuna is tossed with veggies, nuts, fruit and brown rice—it’s sort of like a deconstructed tuna sushi roll in a bowl. It’s so easy, so tasty and it’s great for those summer nights when you really don’t want to heat up the kitchen. Enjoy! Try this with salmon, albacore or yellowtail. If you don’t like raw fish, try this with cooked shrimp. 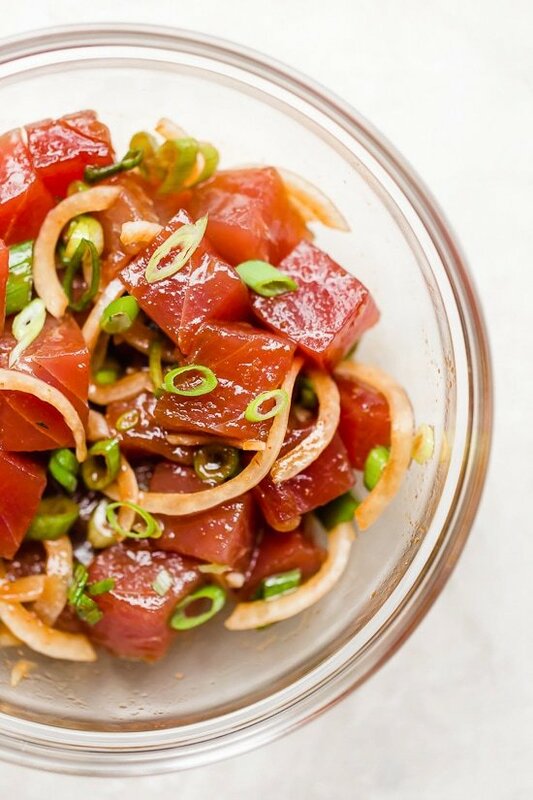 In a medium bowl, combine tuna with onion, scallions, soy sauce, sesame oil and sriracha. Gently toss to combine and set aside while you prepare the bowls. Peel, seed and cube the mango and avocado. Peel, halve, seed and thinly slice the cucumber. Thinly slice the jalapeno and scallions. 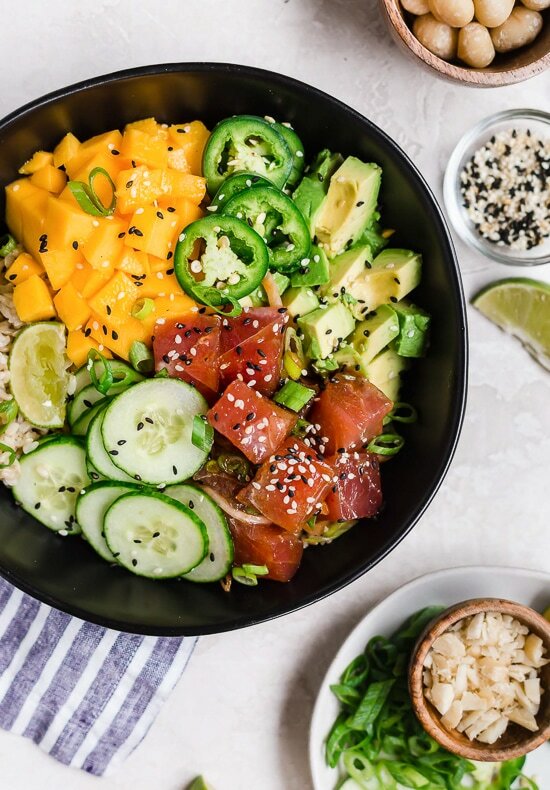 In 2 bowls, layer 1/2 the rice, 1/2 the tuna, mango, avocado, cucumber, jalapeno and scallions. Top with Macadamia nuts and sesame seeds and serve with lime wedges and extra sauce on the side, if desired. I was a vegetarian for more than decade until one fateful camping trip along the rocky hillside of Fort Robinson State Park. After that point, I knew I’d be a carnivore for all the days that lay ahead. Hint: It involved bacon. I’d fallen in love with a hunter, and I’d been dabbling with eating poultry for a few months prior to that trip. My life was quickly changing. All night long, I laid awake in our tent listening to the howls and yips of coyotes coming from every direction. Consequently, when I finally did fall asleep, I slept late, and didn’t notice when my then boyfriend (now husband) left the tent to start breakfast. He brought along unseasoned turkey sausage for me, and bacon—real, smoky crispy bacon—for him. When I emerged from the tent, he handed me a plate of pale and unappetizing turkey sausage (this was 16 years ago; turkey sausage has come a long way since then). Then, he sat down to eat the crispy strips of bacon he’d fried up for himself. I couldn’t help myself. I tried a piece and that was the beginning of the end. I ate ALL THE BACON that day. All of it. We hiked all morning, then stopped at a café in a nearby town for lunch. I ate my first BLT since early childhood. Of course, I ordered it with extra bacon. It was what dreams were made of: smoky, salty, sweet. I ended up getting terribly sick, probably because my body wasn’t used to it. But I fought my way through. It was another six years before I ate beef, but after letting my body adjust, I started to enjoy bacon in moderation. I have to say bacon jam on a juicy grilled burger is one of the best things this side of Fort Robinson. It allows me to enjoy the essence of bacon without revisiting my earlier over-indulgences. Bacon jam balances sweet and salty flavors for a burger topping that takes your backyard barbecue to the next level. The time it takes to make the recipe is mostly wrapped up in frying the bacon. Once that’s done the rest of it comes together quickly, and in one pan, no less. Feel free to dice the bacon as small as you like, but I prefer larger 1-inch pieces chunks of bacon. It’s not so big that you can’t bite through it along with the fixings, but it’s still substantial enough that you get a good taste of bacon with every bite. Think of it like big pieces of smoky, bacon bits floating in a sea of sweet sauce. It takes me back to the bacon and maple syrup flavors of my childhood. 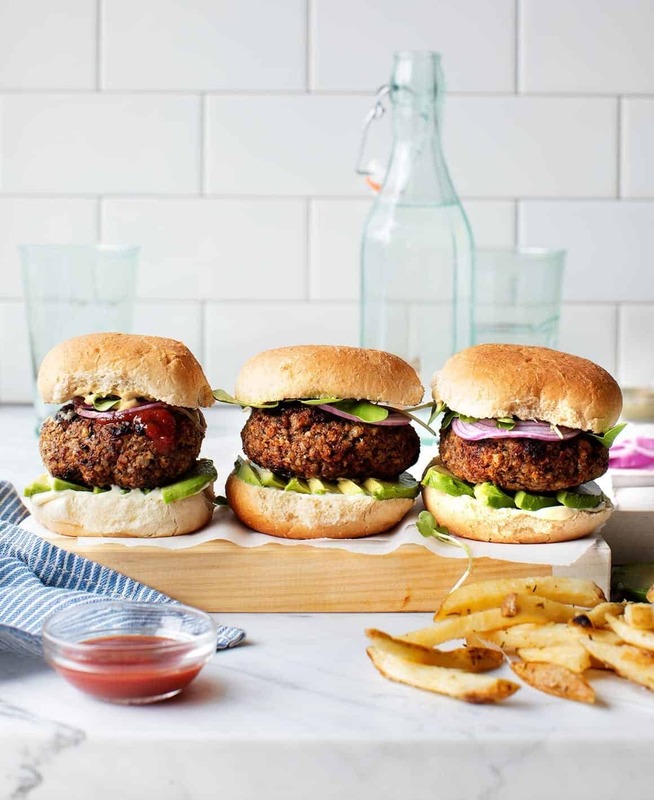 This jam pairs well with other burger toppings such as lettuce, mayo, and red onion or our blue cheese burger sauce. Add it to grilled cheese sandwiches, spoon it into soups, add it to a holiday cheese plate, top your salad, or add it to roasted vegetables. And if you think more bacon is always better, what about bacon jam to a BLT? The possibilities are endless. More Great Toppings for Burgers! Although I’ve never met a sauce—or a jam, for that matter—that I didn’t like, I truly love this tomato jam! Tomato jam is a thick, savory, textured spread that’s flavored with toasted cumin and mustard seed. It’s slightly sweet and earthy tasting. This spread is not chunky like a chutney, nor is it smooth like ketchup. It lies somewhere between the two to create a sauce worthy of almost any dish, but works especially well with sandwiches and burgers. What Kinds of Tomatoes Make the Best Jam? The walls of the fruit are thick, and that provides a higher flesh-to-seed ratio. Fewer seeds make them easier and faster to remove. No one wants tomato seeds in their jam. Also, plum tomatoes don’t have as much water in them, which means less time is needed to reduce the jam. Essentially, you get more for your jam-making buck. Tomato jam is wonderful on burgers, but also as a spread on turkey or grilled cheese sandwiches. Use it to dress up weeknight chicken or spoon it over eggs in the morning. It’s also great on top of crostini with goat cheese and served as an appetizer during the holidays! A jammy sauce like this can take any dish from bland to bodacious. We are at the height of tomato season and it’s time to put those bad boys to work. Can Tomato Jam be Canned? When it comes to tomatoes, I tend to freeze rather than can them. Feel free to double or triple the batch and freeze it in one cup portions to use as necessary. It should keep in the freezer for up to three months. You can serve this jam warm or cold. It’s entirely up to you. I prefer to use a thick-fleshed tomato such as Roma, but any tomato will do. You should be able to find mustard seed in the spice aisle of your local grocery store. Do not substitute mustard for mustard seed. 1 Toast the spice seeds: Toast the cumin and mustard seeds in medium-sized dry skillet over medium heat. Shake the pan occasionally until the seeds become aromatic and begin to crackle and pop, about 6 minutes. 2 Cook the onions and garlic: Add olive oil to the skillet with the spices. After 1 minute, add the onions, garlic, and paprika. Sauté onions for about 10 minutes. They should look soft, oily, and red. Add red wine vinegar and cook for an additional 10 minutes. Stir occasionally. 3 Pulse the tomatoes and onions: Core, halve, and de-seed the tomatoes. Put the tomatoes and the onion spice mixture into a food processor and pulse about 10 times. You want the finished product to be combined, look uniform in shape, but still have a little texture. You don’t want to pulse it so much that it’s smooth like a sauce. 4 Cook the jam: Add the tomato and onion mixture to the skillet along with the brown sugar, salt, and pepper. Cook over medium heat until almost all of the liquid has evaporated and the mixture is thick and jammy. This should take about 15 minutes. 5 Serve or store: Serve immediately or transfer to a lidded container and store in the refrigerator for 1 week. Can be served warm or cold. The jam can also be frozen for up to three months. Hello! All photos and content are copyright protected. Please do not use our photos without prior written permission. If you wish to republish this recipe, please rewrite the recipe in your own unique words and link back to Tomato Jam on Simply Recipes. Thank you! Summer Miller is a freelance writer, recipe developer and author based in Nebraska. Her work has appeared in Bon Appetit, Eating Well, Grit, SAVEUR, and Every Day with Rachael Ray, among others. Her first book is New Prairie Kitchen (Agate Publishing, 2015). Blue cheese sauce is not about subtlety. It’s the food equivalent of a kindergartner doing full-tilt cartwheels through your living room. WHAT DOES THIS BLUE CHEESE SAUCE TASTE LIKE? Blue Cheese Sauce is assertive and salty, with a tangy garlic kick. This sauce is for the spirited among us. It’s for those who want their food to emerge from the shadows and be recognized. My favorite way to use it is slathered on a burger and combined with Bacon Jam. My brother, who is an excellent cook in his own right, taught me the foundation for this recipe. He matched the boldness of blue cheese with the strong flavors of garlic, buttermilk, and sour cream. It only takes minutes to mix together, but you want to let all the flavors mingle in the fridge for about 30 minutes before serving it to the renegades among you. Can I Double Blue Cheese Sauce? A little goes a long way with this sauce, but if you need more for a big gathering or you really love blue cheese then feel free to double or even triple it. It will keep for about a week. The sauce is intended to be chunky, but if you if you prefer a smoother texture, blitz it with an immersion blender or pulse it in the food processor until you reach a creamier consistency. The humble burger doesn’t get all the fun with this sauce. Spoon it over steak, serve it alongside chicken wings and vegetables or thin it out and drizzle it across grilled romaine. Use it as a spread on grilled or cold sandwiches of the cheese, meat or vegetable varieties. More Sauces and Toppings to Try! 1 Combine the ingredients in a medium bowl: Stir together blue cheese, buttermilk, sour cream, garlic clove, lemon juice, Worcestershire sauce, pepper, ground mustard powder, and salt. If a creamier sauce is desired, blend with an immersion blender or in a food processor. 2 Refrigerate the sauce: Place in refrigerator for 30 minutes for flavors to blend. 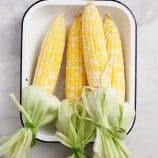 3 Serve: Use immediately or transfer to an airtight container and store in refrigerator for up to a week. Hello! All photos and content are copyright protected. Please do not use our photos without prior written permission. 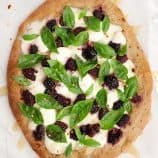 If you wish to republish this recipe, please rewrite the recipe in your own unique words and link back to Blue Cheese Sauce on Simply Recipes. Thank you!